I saw a very young, brightly patterned individual between the hotel and the adjacent rice field. It vanished as I was getting my camera out. It was so brightly patterned that I thought at first it was a Harlequin Monitor (Varanus dumerilii), but all the references I later consulted assured me that the only monitor on Bali is V. salvator. 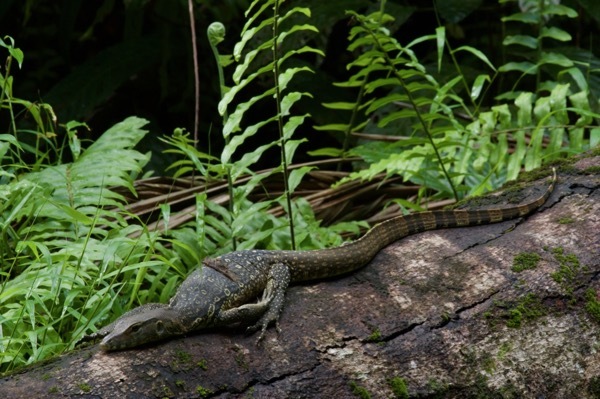 In some areas of southeast Asia, these monitors are a common sight scavenging in public parks, much like pigeons (if you ignore the size, shape, lack of feathers, predatory nature, etc.). But I had a hard time finding them. I expected to see some in Peninsular Malaysia, and even visited a prime water-monitor spot to no avail. So I was very pleased to come across this subadult chilling out on a large downed log near the Bako National Park headquarters.